A recent court of appeals case, Lemke v. Lemke, illustrates why good divorce lawyers try so hard to settle cases. In that case, the judge utilized his own personal experiences with ailments similar to the wife’s as a basis for terminating support. While the appellate court thought that the wife was premature in asserting the “comparison of ailments” issue, it did, in an unusual order, allow her to decide if she wants a different judge on remand. The case raises the question of when judges can bring their own experiences into play in making decisions. 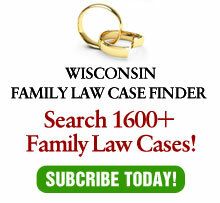 For more on that subject, please read my article on the Lemke case which was just published in the Wisconsin Law Journal.